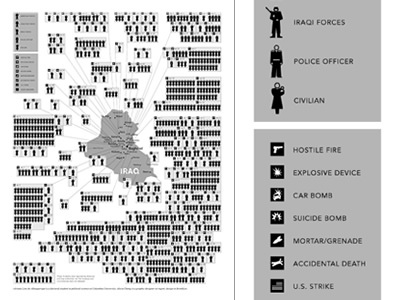 In January 2006, more than 800 people - soldiers, security officers and civilians - were killed as a result of the insurgency in Iraq. While the daily toll is noted in the newspapers and on TV, it is hard for many of us to see these isolated reports in a broader context. 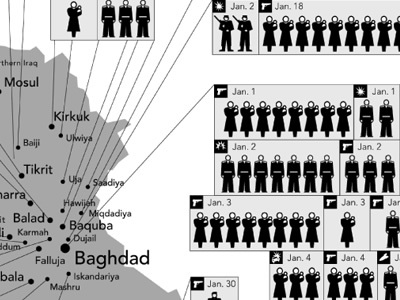 This map, based on data from the American, British and Iraqi governments and news reports, shows the dates, locations and circumstances of deaths for the first month of the year. It was developed by Adriana Lins de Albuquerque, a doctoral student in political science at Columbia University, and by Alicia Cheng, a graphic designer at mgmt. design in Brooklyn. Given the fog of war, the information may be incomplete. Nonetheless, it was the authors' effort to visually depict the continuing human cost of the Iraq war. Not to overstate but in the absence of actual photos of the people killed, this graphic is valuable and should be compulsory viewing for everyone, no matter what their position on war generally or the war in Iraq.